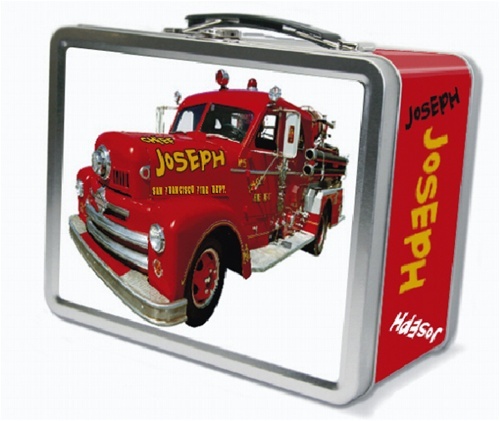 These fire truck lunch boxes are made of .30 millimeter tin (lead free) and covered with printed, laminated high-tack adhesive on all sides. They have a chalkboard on the inside lid for writing notes to your loved ones. The finished size of these personalized metal lunch boxes is 7-5/8" x 6-3/4" x 4". Will ship in approx 2 weeks. Shipping cost is $9.75. gift ! Mommy & daddy had a good laugh. Thanks for your good service..